The settings dialog contains several tabs with specific settings under each one. This page describes the Display settings tab. This allows you to choose which of five screen options is displayed first when you are not in the car. Note that for the first 4 options you may still switch to one of the other screens by selecting the appropriate icon as this only determines which screen is displayed first. Stats - This displays the statistics screen first. Notes - This displays the notes screen first. Laps - This displays the lap times screen first. Standings - This displays the standings screen first. Dashboard - This displays the dashboard even if you are not in the car. This option can be very useful if you wish to view a dashboard such as the Track Map when you are not in the car. Note that if you use this setting then you will not be able to access the other garage screens once the sim has started. To open the settings dialog once the sim has started, click the right side of the screen. Normal - The system default title bar is used at all times. Thin - A thin title base will be used at all times. Note if you choose this option then you may have difficulty moving or resizing the window. None - No title bar will be used. 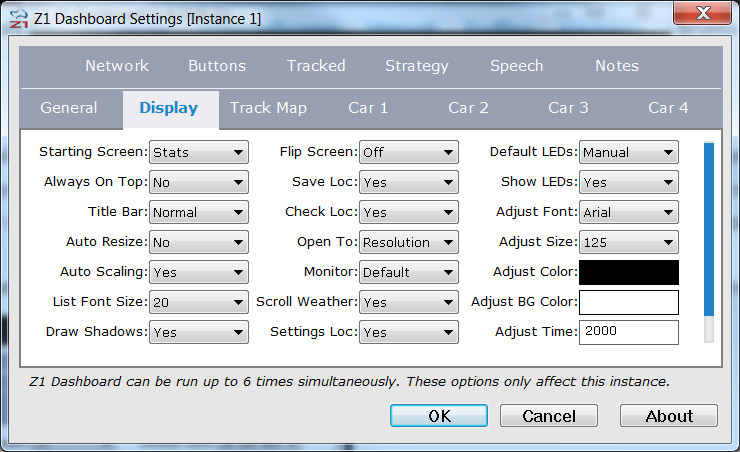 Note if you choose this option then you will not be able to resize or move the Z1 Dashboard window. Racing - The title bar is hidden when you are in the car. This can be either Yes or No. When set to Yes if you change the size of the window with the mouse then the instance will resize its display to fully fit the window. When set to No resizing the window will change the scale (assuming you have Auto Scaling turned on), but the app may not fill the entire window. Note that setting it to Yes can cause a performance hit. This can be either Yes or No. When set to Yes, the default, the app will automatically determine the optimal scaling factor for the current window size. Note that this does not necessarily mean the full window will be used, as you need auto-resize turned on for that to happen. This is the font size that is used to render text in any list. This includes standings screens, driver lists, lists in various track maps screens, lap time lists, etc. When set to Yes shadows will be rendered on the dashboards that support them. This option requires a bit more CPU processing power and could slightly reduce frame rates in the sim. When running multiple LCD Screens, this is the serial number of the screen that this instance of the application should be displayed upon. If this is blank then the Z1 will select an LCD screen to use from those available. This is used in conjunction with the LCD Screen. If you want to turn the LCD screen around so that the USB cord exits from the right instead of the left you should set this to On. This can be set to Yes or No. When set to Yes the instance will save its location upon exiting. When set to No the instance will not save its location. This can be useful if you don't always have a particular monitor connected to your PC and don't want the Z1 to overwrite a default location. This can be set to Yes or No. When set to Yes the instance will check, on start up, to see if it will be displayed off screen based on the position it was when it last ran. When set to No it will display itself at that last position regardless of whether or not that is a valid on-screen location. This is useful if you use USB displays that might not be connected at all times. Scale - The window will open to the default size base on the last used scale. This is an aspect ratio of 480x272 pixels. Resolution - The window will open to the exact resolution (size) it was when you last closed it. Maximised - The window will be maximized on startup. Top Left - The window will be positioned at the top left of the monitor it was on when it was last closed, and take up a quarter of the screen. Top Right - The window will be positioned at the top right of the monitor it was on when it was last closed, and take up a quarter of the screen. Bottom Left - The window will be positioned at the bottom left of the monitor it was on when it was last closed, and take up a quarter of the screen. Bottom Right - The window will be positioned at the bottom right of the monitor it was on when it was last closed, and take up a quarter of the screen. Top Half - The window will be positioned in the top half of the monitor it was on when it was last closed, and take up half of the screen. Bottom Half - The window will be positioned in the bottom half of the monitor it was on when it was last closed, and take up half of the screen. Left Half - The window will be positioned in the left half of the monitor it was on when it was last closed, and take up half of the screen. Right Half - The window will be positioned in the right half of the monitor it was on when it was last closed, and take up half of the screen. Full Screen - The window will take up the entire monitor, but will not be maximized. This can be useful for situations where the maximized option causes problems. This determine which monitor the Z1 Dashboard will open to. The default option lets the Z1 choose the monitor based on where the application was when it closed, and Windows system settings. Choosing a specific monitor number forces the application to start on that monitor regardless of where it was previously. This determines if the weather scroll is displayed at the bottom of the garage statistics screen. The weather display will either be a static line or a scrolling line depending upon available space. Note that not all sims support weather, so even if this option is turned on you may not see any weather displayed for some sims. When set to Yes the Z1 may adjust the location of the settings dialog if it appears it will be off screen. If this results in the settings dialog being displayed in odd locations, you should turn this option off. Manual: You will specify how they illuminate in the Car 3. This lets you choose whether or not the LED lights are displayed within the window. If you are using external LEDs, then you can set this to No to prevent duplication of the LEDs. When you make a change to an in-car setting the Z1 software will display the result of that change on the display in large text for a few seconds instead of the currently selected dashboard. These settings effect how those changes are displayed. This is the font used to display the change. This is the font size to display the change. This is the font color used to display the change. Click on the color swatch to display a color chooser allowing you to specify the color used. This is the background color of the window used to display the change. Click on the color swatch to display a color chooser allowing you to specify the color used. This is the amount of time the change will be displayed. Setting this to zero turns off the feature.